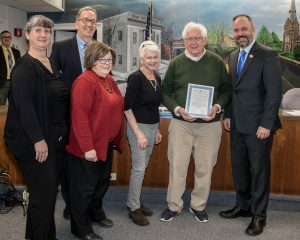 The Mayor and Caldwell Council proclaim the week of March 18, 2019 as Grover Cleveland Week in the Borough of Caldwell. 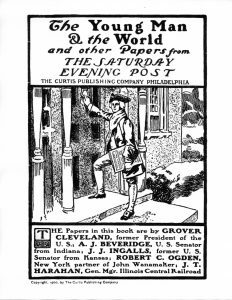 The public is invited in New Jersey, and nationwide, to take part in GROVER CLEVELAND WEEK, a celebration taking place during the week of March 18th, officially proclaimed by the Borough of Caldwell’s Mayor and Council to help mark the 182nd birthday of U.S. President, Stephen Grover Cleveland. 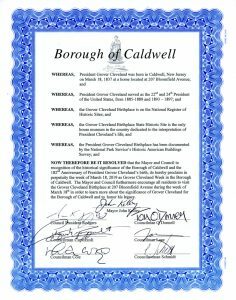 Representatives from Cleveland’s native home-town of Caldwell New Jersey, encourage gestures nationwide that reflect Cleveland’s childhood, as well as his later career. Celebrate with some of Cleveland’s favorite foods and beverages. Or, to honor his terms as President, take time to study our Nation’s founding documents and our notable doctrines. 2. Enjoy some apple-based treats or beverages, and recall local Caldwell hero, Phebe Crane. In 1840, at thirteen years old, she rescued Grover Cleveland from a moving vehicle on Bloomfield Avenue. An ox-drawn wagon heavily loaded with local apples (world-famous for making delicious “Newark Cyder”) nearly ended the future president’s life when he was barely more than a toddler. 3. Read the Constitution, and the Monroe Doctrine. Pocket sized copies of the Constitution will be given to visitors to the Birthplace on March 18th from 1-4 while supplies last. 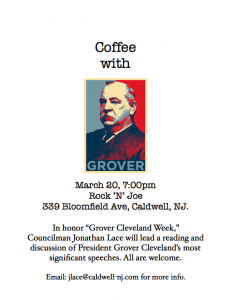 And on March 20th, 7pm, Councilman Jonathan Lace, contact: jlace@caldwell-nj.com , will share round-table style several of President Cleveland’s more famous writings at Rock’n Joe’s in Caldwell. Some of which refer to excerpts from the Constitution. Cleveland vetoed more measures than all the presidents before him combined, multiplied by two, and then some. These numerous vetoes often included detailed explanations of why he was rejecting the proposed legislation, repeatedly citing sections of the Constitution, or explaining that he could find nothing in the Constitution to warrant the bill. He invoked the Monroe Doctrine in foreign relations; during an intensifying border dispute between Venezuela and Great Britain, during the Cuban Insurrection against Spain, and referenced it in his message to Congress in his analysis of the U.S.’s military dealings in Hawaii. 6. Drink a pint, and sing! Your local pub would substitute nicely for the German beer gardens and Irish pubs of Buffalo that could attest to the twenty-something to thirty-something future president who enjoyed both beer and singing, and frequently. Karaoke anyone? 7. Get outdoors at Essex County’s Grover Cleveland Park, or drive to a rural trail in the country, and get in nature. Cleveland loved the outdoors. Fishing, hunting, and just walking. He wrote often of how the outdoors was a great benefit to health and well-being. 8. Sing together at home. The Cleveland children sang together every night with their parents. 9. Guide, or substantially help, a family member struggling to save for college. At fifteen years old, Cleveland’s meager earnings as a clerk at a general store helped to fund the college education of his older brothers. As a young adult he supported the education of his younger sisters, and in his old age, that of his nieces. 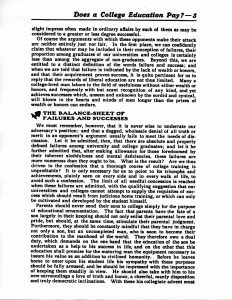 At sixteen, since Cleveland took on being provider to his widowed mother and younger siblings, he never had the time or money to attend college, but he always valued higher education. To his last days, he would speak of how he had wished he could have had the means or time. It is interesting that at about sixteen years old, Cleveland was offered a full scholarship by a neighbor, but the condition that Cleveland must use his education to become a minister, caused him to decline the generous but entangled offer. He had all intentions of becoming a lawyer. 10. 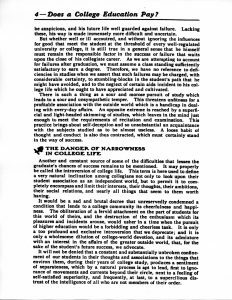 Spend time reading or studying a subject you love. Cleveland enjoyed poetry, historical biography and never forgetting his religious upbringing, regularly read the Bible. Cleveland became a lawyer by “reading for the law.” He had the gift of memorization from a very young age. A story in his law firm went that his dear friend and law partner, Oscar Folsom, relied heavily on Cleveland’s ability to recite precedents from memory. 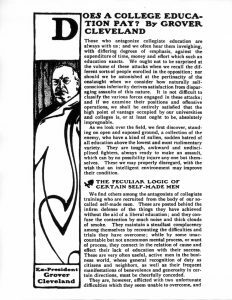 At one point, Cleveland retorted, “Go look it up, and then you’ll remember what you learn.” Folsom replied, “I want you to know, that I practice law by ear, not by note!” then turned on his heel and walked away. 11. Attend a live stage play as a family. Especially during his post-presidency years, Cleveland and his family loved the theater, attending Broadway shows regularly. Later, his youngest son would become an actor, and help co-found a summer theater in New Hampshire. 12. Have your life insurance in order as a tribute to Cleveland’s dedication to trustworthy life insurance policies. He labored long hard hours in his late years stabilizing a major company in the life insurance industry at a time when he said, “its policyholders were distressed with fear and gloomy forebodings” from which he eventually corrected the, “breach of trust….pending its reformation.” He continued as a strong advocate of life insurance during his twilight years. 13. And last, but not least: Consider entering politics as a public service. Cleveland felt his time serving in assorted public offices was his personal sacrifice and offering to his community and his country. He encouraged others who had the energy, honesty and intelligence to do the same. This entry was posted in Uncategorized on March 11, 2019 by Janet Markman. February 18th is Presidents Day! Grover Cleveland was a proponent of governance as defined in the U.S. Constitution, and Presidents’ Day is a perfect time to re-visit how the Constitution created the title of the U.S. President in 1787, and how it laid out the associated responsibilities of the office. Complimentary copies of Article 2 in the Constitution’s original phrases, as well as their accompanying amendments, will be available for visitors to take home. Contained in Article 2 of the Constitution, visitors will learn the titles associated with the office, explore details such as a candidate’s age requirements, election by electors, reasons for removal, invested powers, as well as limitations of power, residency requirements, and more. During the winter months, it is recommended that visitors call the site ahead of time to confirm that snow or ice hasn’t impacted our hours. This entry was posted in Uncategorized on February 12, 2019 by Janet Markman. This entry was posted in Uncategorized on December 22, 2018 by Janet Markman. The Montclair Orchestra recreates a musical experience spanning centuries . Caldwell, NJ — The Grover Cleveland Memorial Association and The Montclair Orchestra present a once in a lifetime event, a reenactment of President Grover Cleveland’s 1893 inauguration, on November 10th at the Women’s Club of Upper Montclair. The formal event benefiting both organizations honors the spirit of the original ball where Cleveland took office as the first and only President to serve a non-consecutive term. 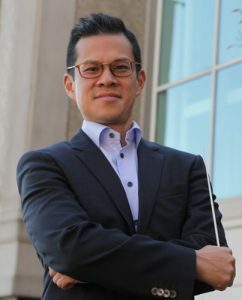 Led by Music Director David Chan, The Montclair Orchestra will regale guests with a performance including selections from Mozart Symphony 29 and Grieg’s “Holberg” Suite. Chan, the concertmaster of the renowned Metropolitan Opera Orchestra, and his musicians will kick off the gala with a rendition of Hail to the Chief and other period pieces, played at the 1893 ball. Their music will also serve as the background for dancing during the night. “Education is key to the mission of The Montclair Orchestra. Partnering with The Grover Cleveland Memorial Association for a fundraiser that supports opportunities to learn while performing historical music is a win for us. We appreciate the chance to be a part of this unique event,” noted Andre Weker, Executive Director of The Montclair Orchestra. In addition to the musical component, a memorable culinary experience awaits guests. A carefully crafted menu has been designed to replicate the cuisine of the period. To top off the gastronomic gaiety, Chef and author Roland Mesnier will serve as auctioneer and keynote speaker. Mesnier spent twenty-five years in the White House as Executive Pastry Chef, preparing French-inspired sweets for five US Presidents. Joined on stage by John Elliott of CBS, Mesnier will delight attendees with humor and tales from the kitchen of the most famous house in the country. He has also graciously donated presidential memorabilia to fundraiser’s auction including a chef’s coat that bears the official White House seal. Beyond the melodious performances and delicious delicacies, the event is truly about remembering history. To tell the story properly, George Cleveland, grandson, and doppelganger of Grover assumes the role of the President. Miss New Jersey, Jaime Gialloreto will play first Lady Frances Folsom Cleveland. Joining George will be his nephew and Grover Cleveland’s great-grandson US Ambassador Thomas Robertson IV as Vice President Adlai Stevenson. John Elliott’s wife, Mary Ellen, steps into the role of Mrs. Adlai Stevenson. Relive the romance of the late 19th Century and support the Grover Cleveland Birthplace and The Montclair Orchestra and the education they provide. Purchase tickets for $300 per person or $500 for Patrons who receive a copy of Chef Mesnier’s book and preferred ballroom seating. Sponsorship opportunities are also available, and all proceeds benefit the Grover Cleveland Birthplace and The Montclair Orchestra. To purchase tickets Click Here or for more information call or contact 973-226-0001. The Grover Cleveland Birthplace Memorial Association (GCBMA) is a conservancy and advocacy group dedicated to preserving the home and legacy of President Cleveland, the only U.S. President born in New Jersey. Through volunteer-based initiatives, our goal is to increase awareness and support of the Grover Cleveland birthplace and its heritage. The GCBMA activities include fundraising in support of educational programs and lectures, interpretation and preservation of the birthplace and its collection of historic objects, and history-themed social activities which engage the public. Working in partnership with the State of New Jersey, we look forward to implementation of our plan to build a Visitor Center on site, providing state of the art space for educational and programming activities, as well as to display historically significant artifacts and exhibitions related to Grover Cleveland and his Presidency. The Montclair Orchestra is a unique training orchestra that offers fellowship playing positions to students from some of the most recognizable music schools in the world, including The Juilliard School, Cali School of Music, Mannes School of Music, Manhattan School of Music, and Mason-Gross School for the Arts. Playing alongside the student fellows are professional ‘mentors’, including some of the world’s best orchestral musicians. Players from the Metropolitan Opera Orchestra, New York Philharmonic, New Jersey Symphony Orchestra, Orpheus Chamber Orchestra, Orchestra of St Luke’s, and other NYC-area orchestras play alongside the student fellows for an unforgettable experience for both musicians and audience. Leading the orchestra in its second season is Music Director David Chan, the concertmaster for the prestigious Metropolitan Opera Orchestra. This entry was posted in Uncategorized on October 30, 2018 by Janet Markman. Caldwell, NJ — The Grover Cleveland Birthplace Memorial Association and The Montclair Orchestra are pleased to announce that Miss New Jersey, Jaime Gialloreto will assume the role of First Lady Frances Cleveland at her husband’s inaugural ball at the Women’s Club of Upper Montclair on Saturday, November 10th, 2018. Adorned in a 19th Century ballgown, Miss Gialloreto will represent the grandeur and splendor of the 1893 inauguration of the Nation’s 22nd and 24th President. “I am excited for the ball because it is giving me an opportunity to step into some of not only New Jersey’s history, but the history of this country as well,” noted the reigning Miss New Jersey. 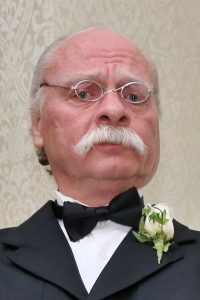 Playing the part of the President himself will be George Cleveland, Grover’s grandson who bears a striking resemblance to the historical figure who was born in Caldwell, NJ in 1837.A history buff himself, Cleveland had the honor of playing his grandfather during the reenactment of his wedding to Frances. “The key to a bright future is learning from the past. The Grover Cleveland Birthplace is the only repository for information and memorabilia specific to my grandfather. It provides a physical, tactile learning experience that you can’t get on the internet. Supporting its existence and growth through an interactive and experiential fundraiser that evokes the emotions of the time period makes perfect sense. 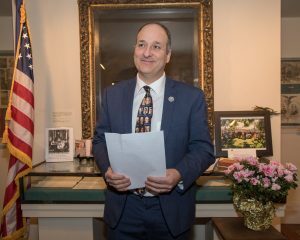 I love that I have the opportunity to be a part of teaching history to others and can contribute to the ongoing education that the Birthplace provides.” Joining George will be his nephew and Grover Cleveland’s great-grandson US Ambassador Thomas Robertson IV playing Vice President Adlai Stevenson. Other celebrity participants include Masters of Ceremonies John Elliott of CBS Morning News along with former White House pastry chef to five presidents, Chef Roland Mesnier. Mesnier’s appearance will include a book signing, the sharing of humorous stories about his life and time in our nation’s presidential residence. Elliott’s wife, Mary Ellen will also be part of the festivities assuming the role of Mrs. Adlai Stevenson. Mary Jean Eisenhower, granddaughter of President Dwight Eisenhower will also be in attendance at the historic fundraiser to benefit The Grover Cleveland Birthplace and the Montclair Orchestra. The evening will feature the actual Inauguration of President Cleveland. The guests will take part in an enchanting and historical evening complete with a musical interlude by the Montclair Orchestra under the direction of Maestro David Chan. It will include dinner and dancing and a live auction conducted by Chef Roland Mesnier. An exhibition of historic memorabilia from the Grover Cleveland Birthplace will be on display highlighting various elements of the President’s early life. The evening’s menu has been carefully selected to reflect culinary trends reminiscent of the time Cleveland was in office. Relive the romance of the late 19th Century and support the Grover Cleveland Birthplace and The Montclair Orchestra and the education they provide. Purchase tickets for $300 per person or $500 for Patrons who receive a copy of Chef Mesnier’s book and preferred ballroom seating. Sponsorship opportunities are also available and all proceeds benefit the Grover Cleveland Birthplace and The Montclair Orchestra. To purchase tickets or for more information, Click Here For more information contact 973-226-0001. This entry was posted in News on October 17, 2018 by Janet Markman. Playing the President during the reenactment of the inauguration will be Grover Cleveland’s grandson, George Cleveland. August 10, 2018 – Caldwell, New Jersey — The Grover Cleveland Birthplace Memorial Association and The Montclair Orchestra are pleased to invite the public to an interactive and opulent ball celebrating the 1883 Inauguration of President Grover Cleveland at the Upper Montclair Women’s Club in Upper Montclair, New Jersey on Saturday, November 10th, 2018 at 6:30pm. Designed to be an immersive experience, the black-tie affair pays tribute to the life and accomplishments of New Jersey’s only native-born President, Grover Cleveland. All money raised will go to increase awareness of Cleveland’s birthplace located in Caldwell, New Jersey and his historical significance. Playing the President during the reenactment of the inauguration will be his grandson, George Cleveland and playing Vice President Adlai Stevenson, will be his great-grandson, US Ambassador Thomas Robertson IV. John Elliott of CBS Morning News along with former White House pastry chef to five presidents, Chef Roland Mesnier will serve as Masters of Ceremonies. Mesnier’s appearance will include a book signing, the sharing of humorous stories about his life and time in our nation’s presidential residence. A formal and upscale gathering, guests will take part in an enchanting and historical evening complete with dinner and dancing to the music of the Montclair Orchestra, directed by David Chan, the Concertmaster of the Metropolitan Opera. An exhibition of historic memorabilia from the Grover Cleveland Birthplace will be on display highlighting various elements of the President’s early life. Transporting attendees back in time will be a display of elegant ballgowns and formal men’s attire including a gorgeous1890’s gown, courtesy of the Morris Museum. The evening’s cuisine will feature delicacies reminiscent of the time Cleveland was in office. To relive the romance of the late 19th Century, guests may purchase tickets for $300 per person and $500 for Patrons, who will receive a copy of Chef Mesnier’s book and preferred ballroom seating. Sponsorship opportunities are also available and all proceeds benefit the Grover Cleveland Birthplace and The Montclair Orchestra. To purchase tickets or for more information, Click Here or contact 973-226-0001. 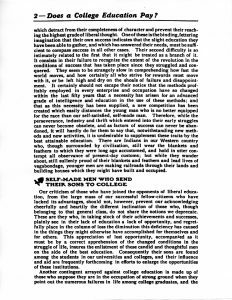 Grover’s 1900 article “Does A College Education Pay” from The Saturday Evening Post. This entry was posted in News on August 26, 2018 by Janet Markman. A flurry of activity took place at the Grover Cleveland Birthplace in June when Gateway Fence of Cedar Grove, NJ arrived on site. Their mission was to stabilize and rehab the elegant wooden fence that defines the Birthplace property along Bloomfield Avenue. The historically accurate fence has enhanced the Birthplace over the past three decades but was showing signs of age, so plans went into action to save it for the future. Michael Brown, owner of Gateway Fence generously agreed to donate time and expertise to make the fence shipshape, just in time for the Annual 4th of July Ice Cream Social. After consultation with Sharon Farrell, Caretaker of the Birthplace and with officials from the NJ State Department of Environmental Protection, approval was given for Gateway to perform stabilization work on the fence. On June 18 Mike’s crew of technicians repacked or set into concrete the upright posts making them plumb and reattached the various wooden elements of the fence that had come loose. As a result, the fence is now in stable condition and ready for a fresh coat of stain, which will further safeguard it. Photographs from the 19th century showed a fence in place along Bloomfield Avenue, but by the late 20th century the fence was gone. In 2001 the GCBMA decided to create a historically accurate reproduction of a fence typical to Caldwell in the 19th century and commissioned Walpole Woodworkers to produce and install one. 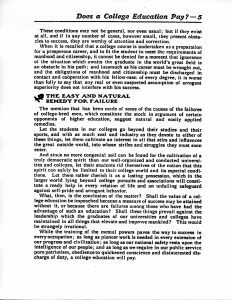 At that time, Dorothy Budd Bartle, GCBMA President donated the majority of the approx. $38,000 needed to purchase the fence; upon installation the GCBMA donated the fence to the State of NJ. In May 2018, GCBMA Board Member Bruce White reached out to Michael Brown, owner of Gateway Fence of Cedar Grove, NJ to ask for his expertise and advice on how best to save the fence which was visibly deteriorating. Mike offered to assess the fence and make the repairs necessary to stabilize it, doing so as a charitable contribution. During his initial site visit, Mike quickly determined that many of the upright posts were leaning and showed signs of wood rot; he noted that many of the other fence elements showed signs of rot and were starting to fail as well. The GCBMA is committed to further preserving this very visible element of the Birthplace site, so additional planning is ongoing, in concert with plans to construct a new Visitor Center on site later this year. In the meantime, we can all rest easier knowing that the fence is stable and looking better than it has in years. Thanks again to Michael Brown and Gateway Fence! This entry was posted in News on August 25, 2018 by Janet Markman. This entry was posted in Event on July 30, 2018 by Janet Markman.